The eighth largest city in the nation is also the second largest city in the State of California, San Diego. Located just north of the Mexican border, San Diego boasts an idyllic location on the Pacific Coast and is home to a long list of amazing features and amenities that go far beyond the gorgeous golden sand beaches. The Greater San Diego area has a multitude of dazzling luxury homes perfectly situated in some of the county’s most affluent and esteemed communities. Among those distinguished luxury home markets, you’ll find Cardiff, formerly known as Cardiff-by-the-Sea. With a rich, diverse culture, low crime rate, top-rated schools and spectacular subtropical climate, Cardiff-by-the-Sea, is truly a must-consider destination for luxury home buyers in San Diego County. 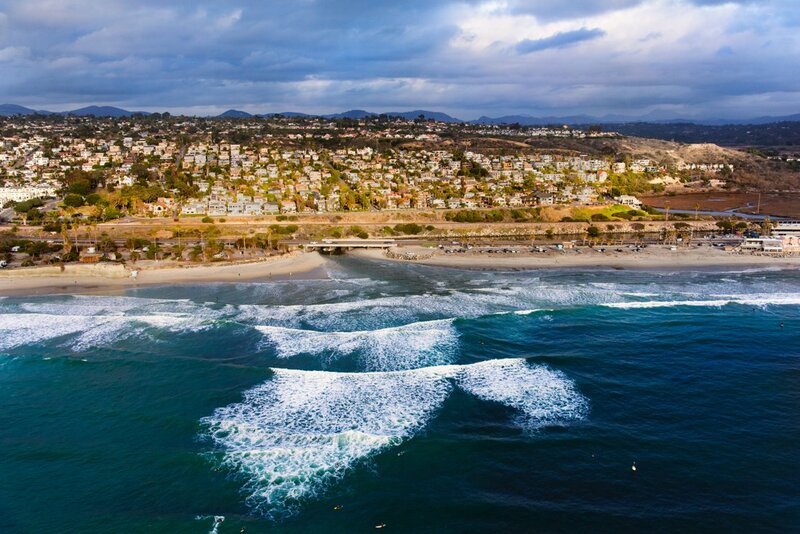 The picturesque coastal town of Cardiff is composed of 2.6 miles of pristine coastline situated in Encinitas, California, between Encinitas proper and Solana Beach. Even though it operates under the umbrella of Encinitas in most aspects, Cardiff does have its own 92007 zip code, unlike other parts of Encinitas. Home to a population of around 12,000 residents, Cardiff is just ninety-five miles south of the excitement of Los Angeles and only twenty-five miles north of San Diego. This extraordinary community has founded by J. Frank Cullen, a famous developer whose wife was from Wales, hence the Cardiff designation and the many English street names. The “by-the-sea” was added on years later by a community developer, and then more recently was removed. With a market, post office, libraries, and other much-desired conveniences all within walking distance, this delightful community is an ideal place to call home. The local lagoon and beaches are prime examples of the abundance of postcard-perfect natural beauty here. And along the beaches, you’ll find outstanding dining opportunities. Restaurant Row affords Cardiff residents and visitors an assortment of mouth-watering cuisines from which to choose, including California dishes, Vegetarian, Mexican, Italian delicacies, and of course fresh seafood. Establishments that are favored by the locals include Pacific Coast Grill, Pipes, The Beach House, The Chart House and Trattoria Positano. Recreational opportunities, on land and in the water, also abound in Cardiff. The San Elijo Beach Campground has excellent beach campsites, beach parking service, and lifeguards. Glen Park is a great place to enjoy the outdoors and has picnic tables, a children’s play area, basketball and tennis courts. There are multiple fields for soccer and baseball enthusiasts to enjoy at the Cardiff Sports Park, and those seeking water activities should check out Cardiff Reef. Cardiff Reef is a surfing hub that is situated at the San Elijo Lagoon entrance along historic Highway 101. San Elijo Lagoon is a 900-acre state wildlife preserve providing the opportunity to enjoy the area’s delightfully moderate climate, 300 bird species and an abundance of natural beauty. If you are searching for a peaceful place to live where you can effortlessly enjoy the sights, smells and sounds of the ocean, captivating sunsets, and extravagant luxury, you must consider the homes for sale in Cardiff. Cardiff has two primary residential neighborhoods, The Walking District, and The Composer District. The Walking District, in close proximity to Glen Park and several shopping and dining options, is found south of Birmingham. The Composer District has many homes with ocean views and numerous streets named after famous composers, hence the neighborhood’s name. Cardiff luxury real estate includes diverse architectural styles, among them Spanish, European, Mediterranean, and Contemporary designs. You can find Cardiff luxury homes with ocean and lagoon views, swimming pools, private gated drives and a long list of other coveted amenities. If you would like more information regarding the enchanting luxury properties of Cardiff-by-the-Sea in Encinitas, California, please allow us to assist you and contact us today.